For financial services businesses, the stakes have never been higher. Digital transformation has made it increasingly easy for consumers to switch institutions at the least provocation. But leaders like Capital One, Guardian Life, and Goldman Sachs are embracing change and moving to the cloud. They’re creating great customer experiences—and fighting churn—by integrating email into their web and mobile banking, credit, and insurance apps. 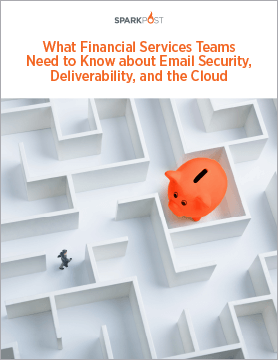 In this guide, you’ll discover what financial services technology and product teams need to know about email security, deliverability, and the cloud—and why getting it right is essential to your customer experience. Download this guide and “Unleash Your Competitive Superpower” today! Get started today and see how SparkPost delivers your product’s emails on time and to the inbox.